Cuba’s vintage car phenomenon is unique. Travelers are flocking to Cuba to see this beautiful island and the time capsule it has become. You can even go on an organized tour to Cubafor vintage car fanatics to trace this special island through the lens of the ultimate collections of American cars from the 1950’s and 60’s. So what’s with all the vintage cars? 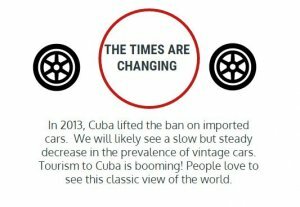 When you see pictures of Cuba, you may have seen streets filled with vintage American cars and wondered “Why?” Well to answer this question, you first need to understand the island’s historical foreign policies and how those policies are not only changing today but also having a profound although slowly shifting cultural adjustment. To get some more background on Cuban policy, let’s go back to 1959. 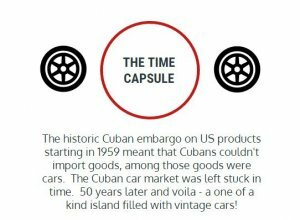 That was the year Fidel Castro took office and placed an embargo on U.S. products, which meant that Cubans weren’t able to import goods and among those, were cars. Because of this, Chevrolet, Buick and Ford models that would belong in any American car museum can be seen on the streets of Havana. Fascinatingly, they share the road with some Eastern European cars of the 60’s and ‘70s as well. So how do these cars still work? The answer is, Cubans managed to fix the engines and switch them around. You read that correctly! That means a Chevy may have an engine that belongs to a Ford. Cubans paint these cars over and over again to give them that “new car” feeling. This results in cars having five or six layers of paint on top of the original color. Note that most cars don’t even have air conditioning and their max speed is considerably lower than modern models. You probably already know that the embargo was lifted. And yes, since 2013 Cubans have been able to buy imported cars. The one major factor that is stopping cities like Havana from overflowing with updated cars (and won’t that be a shame when it happens) is the cost of these cars. As we all know, new cars have an average cost of $25,000. If we consider that the average monthly wage in Cuba is $25 well…you do the math. While most Cubans can’t afford to upgrade their cars just yet, there are some that just love their vintage car! Any car lover can certainly relate. Some locals have made a business out of taking tourists for a ride. It’s Cuba’s version of a Central Park carriage ride. Under the Obama administration, there have been massive changes in the US approach to Cuban relations. In fact, more business deals between countries are being authorized now than ever before and travel to Cuba is on the rise! Now’s the time to plan a trip to Cuba. The borders are open but the vintage cars are still there. Who wouldn’t want to take a ride in a Chevy Bel Air?